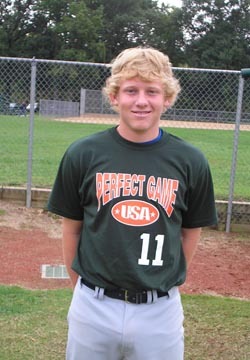 Chris Ayers is a 2010 C/OF that attends Manchester HS and resides in Chesterfield County, VA with a 5'10", 160 lb. frame. Chris has an athletic build and looks like one of the top young defensive catchers in the country. He has the catch and throw skills to be playing college baseball right now. At the plate Chris has a level swing and produced solid line-drive contact. As he gets older he has the athletic ability to become a solid all-around hitter. He is a little long right now at the plate and will need to work on shortening his swing. Behind the plate Chris has everything you look for in a catcher. He has very good footwork to go along with his already strong arm (78) and release. (1.96) Chris ran a 7.54 60-yard dash on a slow track which shows he has good athleticism for his age and position. Chris looks like a kid that could be a highest-level college prospect and maybe see some draft attention as his senior year rolls around.